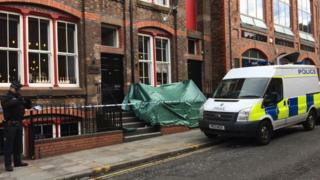 A man who died after being stabbed in a Liverpool bar has been named by police. Sam Cook, 21, from Crosby, was involved in an "altercation" in the basement of the Empire Bar on Seel Street on Saturday night, police said. A post-mortem examination found he died from a single stab wound to the heart. A 20-year-old man from Anfield has been arrested on suspicion of murder and a 19-year-old woman has been arrested on suspicion of assisting an offender. Both are being questioned by police.